Map of Jebus or Salem. As you can see from the map above, I’ve made some progress in researching the possible layout of the wall’s of Jersualem. The map I have created shows what the original city wall position MIGHT have looked like, in about 2000 BC. The city now known as Jerusalem was called Jebus, or Salem before it became known as the city of David, and finally by its current name. I wrote about my “little idea” the other day in this Bible Cartoons Blog and noted some of the difficulties of trying to find a definitive map of the walls of Jerusalem. There are lots of different ideas (and maps!) on the internet all different from each other, which makes being certain about what the walls looked like very difficult! One major difficulty is the amazing amount of changes that have been made to the walls, over the centuries. Whole sections of wall, not to mention gates and towers have been built, pulled down, and rebuilt. And no-one seems to have kept very good records of all that civil engineering over the ages… or, if they did, the records have long ago turned to dust! The initial problem was trying to find a good contour map of the topography of the land underlying Jerusalem. Eventually I found one that I liked, but I noted a few errors on it. So I have recreated that contour map, and added more contour height indicators. I’ve added my own version of the shading that (hopefully!) helps viewers to interpret all those lines, and (again) hopefully see a more 3D bird’s eye view of the landscape underneath Jerusalem. The result of a whole day’s labour of contour line drawing is the map that underpins the one above. The ancient “city” of Jebus/Salem was probably a rather modest walled town, occupying only a few acres of land. But how has it changed over time? Here I quote from Galyn Wiemers’ fascinating account “Jerusalem – History, Archaeology and Apologetic Proof of Scripture” to give you some estimations of the city’s size and increasing population over the centuries. “02) By the time king David made it his royal residence in 1005 BC, it [Jerusalem] was about 10 acres in size and had a population of about 2,000. 03) In Solomon’s city of 940 BC, he included 22 more acres to the north of the City of David. The population was about 5,000 at this time. 04) Hezekiah’s city expanded to the west over the Central valley on up to the Western Hill. The total area of the walled city was about 125 acres with an estimated population of 25,000. As you can see from these few figures above, the size and extent of Jerusalem has altered a lot over time. Obviously, to accommodate the increasing population, the outer walls have been re-modelled over time… which can make it difficult to be precise when it comes to some poor old artist trying to figure out which wall, gate or tower goes where in his illustrations! Although I have drawn the outer walls of Jebus/Salem on my contour map, please don’t think this is anything more than my approximation of where the walls MAY have been! It is really difficult to be certain about anything very much from 4,000 years ago, and the position of the walls that protected this ancient city are no exception! As I read more about the walls I may very well update the maps I draw to reflect new (to me!) information. The importance of water from the Gihon spring for Jerusalem. You wouldn’t believe how difficult it has been trying to figure out exactly where the Gihon spring is located! That is a key feature of the maps I have drawn (and will draw in future) since it was, and is, the only naturally occurring spring that the inhabitants of Jerusalem could access. Why is the position of the Gihon spring important? Well, for one thing, it affected the wall layout above the water source… and that affects my drawings! The Gihon spring is the only (intermittent) spring that provides water to the ancient city. Apart from the defensible nature of the hill structure that Jebus/Salem was built on, the spring’s presence is the other primary reason that the city came into existence in the first place; water being a vital resource then, and now. 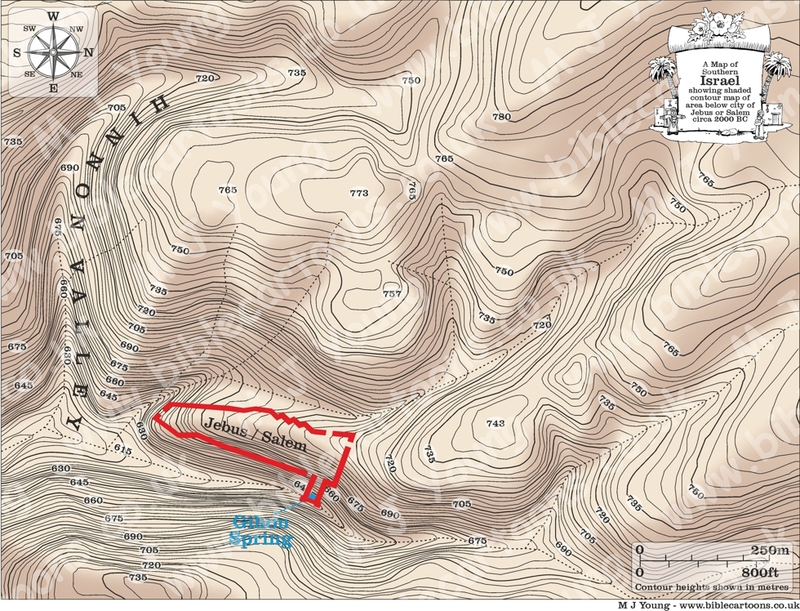 Although the Gihon spring is described as being “situated in the Kidron valley on the East side of “Ophel,” and due South of the temple area” (International Standard Bible Encyclopedia), it’s exact position is a little elusive, but I think I’ve more or less positioned it correctly on my maps. In a very recent (2007) archaeological excavation the remains of two stone towers were discovered near the Gihon spring, which were probably erected to protect the water source from attack from enemies of the city. I have included these two towers, which enclose and protect the spring, on my maps – they’re the sticky out bits on the east side of the wall! Some features seem to be fairly constant in the city, across the centuries. Having looked at several interpretations of the wall layout of Jerusalem, most of the maps I’ve seen draw the Dung gate at the southern end of the city, leading out into the Hinnon Valley. Also, most maps seem to position the Water Gate very close to the Gihon spring, indeed, it would be reasonable to assume that this is why it was named “the Water Gate” in the first place! The Fountain Gate is closer to the Dung gate, in the south eastern city wall, in many maps I’ve looked at. Altogether it seems I won’t be going terribly wrong if I draw these gates where I’ve positioned them on my map above! Please note the orientation of the compass on my maps. Normally north is “up”, south is “down”, etc. Since the city is long and thin, it made sense to draw it with west being “up” and east being “down”, and besides, the original contour map was orientated like that, so the precedent had already been set! A spring in Jerusalem, evidently sacred, and, for that reason, selected as the scene of Solomon’s coronation (1 Kings 1:38). It is without doubt the spring known to the Moslems as `Ain Umm edition deraj (“the spring of the steps”) and to the Christians as `Ain Sitti Miriam (“the spring of the lady Mary”), or commonly as the “Virgin’s Fount.” It is the one true spring of Jerusalem, the original source of attraction to the site of the early settlers; it is situated in the Kidron valley on the East side of “Ophel,” and due South of the temple area. See JERUSALEM. The water in the present day is brackish and impregnated with sewage. The spring is intermittent in character, “bursting up” at intervals: this feature may account for the name Gihon and for its sacred characters. In New Testament times it was, as it is today, credited with healing virtues. See BETHESDA. Its position is clearly defined in the Old Testament. Manasseh “built an outer wall to the city of David, on the West side of Gihon, in the valley” (= Nahal, i.e. the Kidron; 2 Chron. 33:14). From Gihon Hezekiah made his aqueduct (2 Chron. 32:30), now the Siloam tunnel. The spring is approached by a steep descent down 30 steps, the water rising deep underground; the condition is due to the vast accumulation of rubbish—the result of the many destructions of the city—which now fills the valley bed. Originally the water ran down the open valley. The water rises from a long deep crack in the rock, partly under the lowest of the steps and to a lesser extent in the mouth of a small cave, 11 1/2 ft. long by 5 ft. wide, into which all the water pours. The village women of Siloam obtain the water at the mouth of the cave, but when the supply is scanty they actually go under the lowest step—where there is a kind of chamber—and fill their vessels there. At the farther end of this cave is the opening leading into the aqueduct down which the water flows to emerge after many windings at the pool of Siloam. The first part of this aqueduct is older than the time of Hezekiah and led originally to the perpendicular shaft, connected with “Warren’s tunnel” described elsewhere (see SILOAM; ZION). The preeminent position of importance which Gihon held in the eyes of the earlier inhabitants of Jerusalem is shown by the extraordinary number of passages, rock cuttings, walls and aqueducts which exist all about the spring. Walls have been made at different periods to bank up the waters and direct them into the channels provided for them. Of aqueducts, besides the “Siloam aqueduct,” two others have been formed. One running from the source at a considerable lower level than that of Hezekiah was followed by the present writer (see Palestine Exploration Fund Memoirs, Quarterly Statement, 1902, 35-38) for 176 ft. It was very winding, following apparently the West side of the Kidron valley. It was a well-cemented channel, about 1 1/2 ft. wide and on an average of 4 1/2 ft. high, roofed in with well-cut stones. There are no certain indications of age, but in the writer’s opinion it is a much later construction than Hezekiah’s aqueduct, though the rock-cut part near the source may be older. It was discovered by the Siloam fellahin, because, through a fault in the dam, all the water of the “Virgin’s Fount” was disappearing down this channel. A third aqueduct has recently been discovered running off at a higher level than the other two. It is a channel deeply cut in the rock with curious trough-like stones all along its floor. It appears to be made for water, but one branch of it actually slopes upward toward its end. The pottery, which is early Hebrew, shows that it is very ancient. The whole accumulated debris around the source is full of pre-Israelite and early Israelite pottery.